A feature-rich hosted PBX to meet the demands of any business. call screening & call "break in"
Our carrier networks provide 100% coverage of Australia and New Zealand. 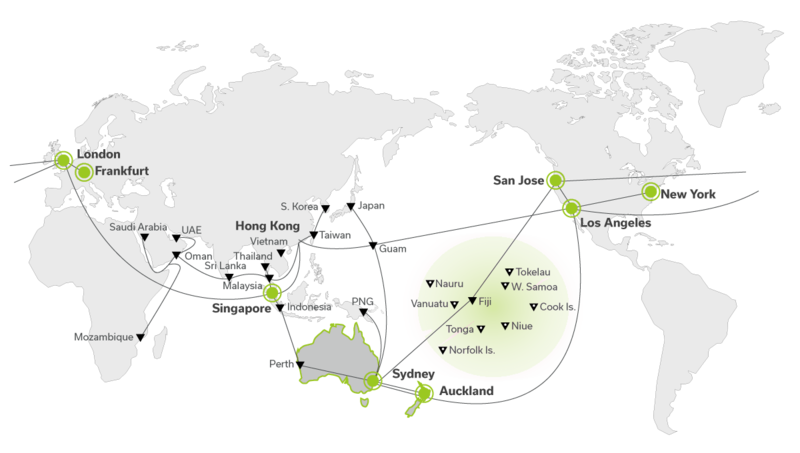 While more than 220 Tier 1 Carrier interconnects and points-of-presence (above) extend our reach to every corner of the globe. * new customers only; access only; only pay for calls. Additional monthly charge for 1300 / 1800 numbers. Ongoing monthly access & call charges additional. Call charges are not included in the monthly cost. All services are initially prepaid until a stable credit and payment history can be established. There is no guarantee a postpaid service may be offered. Call credit does not expire but any remaining balance is forfeited on cancellation. Charged by the second with no flagfall. If your call lasts only 20 seconds, you pay just 6 cents. Hosted PBX is the fastest and most feature-packed way to get your phones up and running. Deployment is fully automatic and it's simple to use. With an ezypbx you're free to number your extensions however you like. In fact, there's no reason you couldn't design and implement your entire new ezypbx within 10-20 minutes! ezypbx will lower the cost of a phone system for your business. Expand your office to a different building, or your employees can work from home ... even the other side of the world ... and you can call each other for free! Imagine the simplicity of attaching a PDF to an email, addressing it to our dedicated ezyfax address, putting the recipient's fax number as the subject on the email ... and hitting send. And better yet, all incoming faxes are sent directly to your email inbox. Finally there's a way to run a paperless office, for only $7.49 per month, plus fax call charges as low as only 12c to any Australian fax line ... and you can receive an unlimited amount of faxes free!. We use service-specific, "generic" URLs such as voipserver.net.au to "grey label" each service, making them perfect for you to start reselling in minutes. So send us your details and we'll be in touch pretty quickly.